Chelation was never used by the majority of parents on their autistic kids. And that is a good thing. Chelation use is way down in the autism communities, but it hasn’t gone away. Many of those who use chelation are also vaccine antagonistic, and many of those rely upon the Chochrane reviews to support their vaccine-antagonistic arguments (generally by cherry picking and misrepresenting the Chochrane reviews). So, I was intrigued when I saw this abstract come up recently: Chelation for autism spectrum disorder (ASD). A Chochrane team looked at the evidence for chelation and found that there is none. 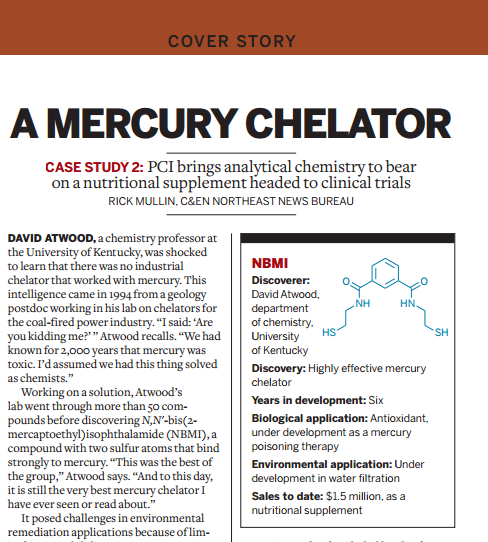 A while back there was a plan for a chelation trial at the National Institutes of Health. It was cancelled when animal studies found a drop in cognitive scores when chelation was used without heavy metal intoxication. Which is to say, if you chelate someone needlessly, you could be shaving off IQ points. And since there is no evidence that autism is a form of heavy metal intoxication, chelation may actually have been harming already disabled kids. Yeah, I know that teams of people with MBA’s and other non-related degrees will tell you that there is evidence. As will doctors who sell chelation. Or recommend it (Hello, Dr. Bob Sears, I’m talking to you and your community of non-autism docs). They are wrong. And potentially harming autistic children. We searched the following databases on 6 November 2014: CENTRAL, Ovid MEDLINE, Ovid MEDLINE In-Process, Embase,PsycINFO, Cumulative Index to Nursing and Allied Health Literature (CINAHL) and 15 other databases, including three trials registers. In addition we checked references lists and contacted experts. We excluded nine studies because they were non-randomised trials or were withdrawn before enrolment.We included one study, which was conducted in two phases. During the first phase of the study, 77 children with ASD were randomly assigned to receive seven days of glutathione lotion or placebo lotion, followed by three days of oral dimercaptosuccinic acid (DMSA). Forty-nine children who were found to be high excreters of heavy metals during phase one continued on to phase two to receive three days of oral DMSA or placebo followed by 11 days off, with the cycle repeated up to six times. The second phase thus assessed the effectiveness of multiple doses of oral DMSA compared with placebo in children who were high excreters of heavy metals and who received a three-day course of oral DMSA. Overall, no evidence suggests that multiple rounds of oral DMSA had an effect on ASD symptoms. The journal Pediatrics has a large number of autism related articles in a recent supplement. One of these covers a topic discussed a great deal by parent groups online: alternative medical approaches to the treatment of autism. In Complementary and alternative medicine use in a large pediatric autism sample, James Perrin (this one of his five articles in the Supplement; Dr. Perrin is the president elect of the American Academy of Pediatrics) and his coauthors use the Autism Treatment Network (ATN) to review parent report of use of complementary and alternative medicine (CAM) in regards to autism. Some of the most talked about methodologies are rarely used. Chelation, for example, had only 19 respondents or 0.6%. Hyperbaric oxygen, 0.4%. Previously, chelation had been reported as being used by about 7% of families. If these studies are comparable, this would indicate that chelation has dropped from low to very low in use by parents. As with other CAM use, it will help to determine more about the potential synergistic effects of CAM with medical treatments as well as ways that CAM use may interfere with improvement in medical conditions.